In the “Already a member?” section there is a link “click here to log in“. Do so using your email address or username. Don’t worry if you’ve forgotten the password you created when you signed up. You can just use the forgotten password feature on the login page. As long as you are logged in, you can always return to the Tech Club page by clicking on “Tech Club” in the menu at the top. 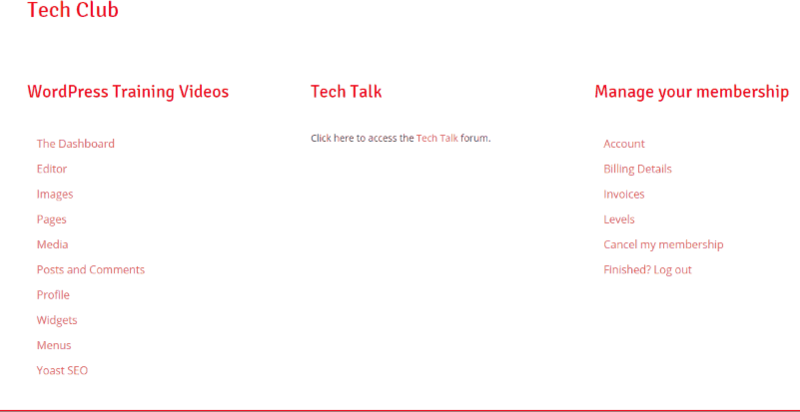 Access the Tech Talk forum to ask any questions about your website that you’re not sure about. You’ll receive an answer and other members will be able to see and benefit from the answer. cancel your membership. Cancellation means that your membership will terminate at your next renewal date. Please feel free to continue watching the videos until that date. ← Why do I recommend SiteGround Website Hosting?